Blackhawk Special Operations Medical Back Pack FREE SHIPPING! This Blackhawk back pack was designed with the help of the elite military medics who know the most efficient techniques in field trauma care. The BlackHawk Special Operations Medical Back Pack will open fully to display items needed in an emergency. The back pack is a mid-sized frameless pack, with super comfortable contour padded shoulder straps and waist belt. 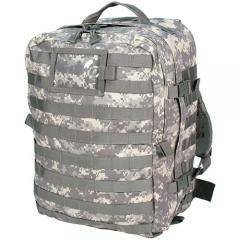 Dimensions: 13" X 18" X 18"
©2002-2019 CopsPlus.com: Blackhawk Special Operations Medical Back Pack FREE SHIPPING!